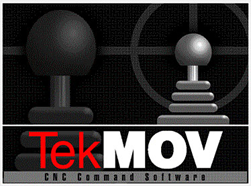 The TEKMOV control software is a fully featured flatbed control program. It is configurable to accommodate different motor configurations, accelerations, speeds, resolution, relay switching etc. It accepts commands in the ISO GCode, and HPGL-2 language, with extensions for 3D profiling. It’s features are modular, and can be enabled by issuing a password to unlock optional features. It is capable of Auto Tool Change control, tangential knife control, camera based registration mark job orientation etc. Please refer to the TekMOV feature list for full description of the program’s capabilities.